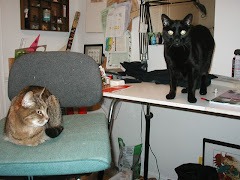 I was working in my studio when, out of the corner of my eye, I saw Ray enter the now-abandoned cat room. I waited a moment, listening for sounds of trashcan rustling, then when no sounds occurred, got up to investigate. Ray was standing in the middle of the room with a bone in his mouth, his tail swinging uncertainly. My throat closed and tears stung my eyes. I knew that Ray thought his favorite game of keep-away could get his cats to come out of hiding. "Gimme that bone, Ray," I said to the dog, my usual announcement that I was in on the game. Ray's tail started wagging in earnest as he turned and headed for the stairs. I followed, calling "Gimme that bone!" As I reached the landing, Ray a few steps in front of me, I noticed Chester coming up the front walkway. Just what we both needed to take our minds off, I thought, a visit from Chester. Chester came with our new neighbors and is the pugs' 14 year old cat-brother. Not only is he the world's friendliest cat, he is also the world's most mellow. I haven't written about Chester before because I thought my first posting mentioning him would be about the tragic death of the neighbor's cat at the mouth of the overexcited blind hound. Quite frankly, it still could happen. Chester has NO fear of Ray. Which is turning out to be a good/bad thing. Ever since Chester started coming by, which was about a week after the neighbors moved in, I have spent part of almost every day trying to desensitize Ray to Chester's presence and to convince the hound that Chester is part of his pack, but I've had mixed results. Although Ray seems to love (the taste of) the cat, he also seems to think Chester is some kind of wind-up toy that, if nibbled or nudged enough, will slap Ray in the face. On occasion, Chester obliges. Ray likes it. As we headed down the rest of the stairs, Chester saw us through the glass door, picked up his pace a bit, and meowed. Ray, still with bone in mouth and now with ears deployed in Dumbo mode, stood alertly inside the door as I went out to give Chester a good petting. Since I had been in the middle of something when I went to check on Ray, I reentered the house and headed back upstairs. Five minutes later, I was done. As I exited my studio, I noticed Ray, still alert but now lying upright on the stair landing, still with bone in mouth, still with ears deployed in Dumbo mode, and with eyebrows now doing the Flatley on his forehead, intently 'staring' down at the front door. Chester was staring back in. I laughed. Obviously the dog was worried about Chester stealing his bone. Followed by the dog, who was still holding his bone, I went back down and opened the front door. Chester moved away a bit. "Ray do you want to come out and say hi to Chester?" I said to the dog who was standing on the threshold. Ray stood for a moment thinking about it. I waited, ready to grab the dog when, as is his wont, he made a dash to meet his new friend. But instead of rushing out at high speed and tap, tap, tapping around to find the cat, I watched, astounded, as Ray, tail swinging and bone still in mouth, picked his way slowly out the door, down the first step, and once on the walkway, gave a come-hither look over his shoulder. Obligingly, Chester followed. Eyeing the dog suspiciously and laughing myself silly, I knew that Ray was luring that cat out into the open so he could better eat him. Tail still swinging, Ray slowly continued onto the front lawn. Being no dummy, Chester followed only as far as the patch of dirt that now borders the new walk and sat down. Ray stopped when he sensed the cat wasn't following him and circled back around. Watching the dog curiously, but not apprehensively, Chester waited until Ray looked like he was going to walk right over the top of the cat, then slowly made his way to the azaleas bordering the front porch and laid down in the shade of one of them. Still with bone in mouth, Ray stopped, laid down on the walkway nearby, placed his bone across one shoulder as bait, then stretched out his neck toward Chester to show him easy access to the treat. Chester approached to see what kind of treat was being offered, but for some reason, was not enticed by the large, rolled rawhide. After watching this scene play out, and still waiting for Ray to make his move, I squatted between the two friends, petting each in turn, ready to make a grab for the dog. I didn't have long to wait. After a few minutes of pretended disinterest, Ray couldn't take it anymore. He leapt to his feet and made a grab for the cat. I grabbed the dog. Unconcerned, Chester never moved. *Court is in reference to the fact that we live on one. It's a pun. Hahahahaha, brilliant, gotta love a cat who just doesn't give a rats bum !! I can see a bromance blossoming here, how great for Ray to have some feline company, and also for you guys too, 'cos you do miss scritching a cat. I know since mine migrated upstairs to avoid Rocky's over zealous attention I have felt a bit bereft of their purrings, although on the plus side I am not as hairy. Yeah. We refer to Chester as our bridge cat. He'll be good company for us until we decide to take the plunge again (after we go on vacation). and hahahahahaha about the cat hair. Chester is very cool. He reminds me of the cat Blueberry met when she was doing water therapy. That cat was unflappable. Blueberry lunged at her a couple of times and she didn't even flinch. Just slowly blinked her green eyes. Blueberry didn't know what to make of her. Also love the title of this post! The second paragraph made me tear up. Bless Ray's heart. But the rest is laugh out loud. That Chester! What a cool cat! How fitting...a black cat. One who, unlike Hugo, doesn't fear Ray. Do you think Ray knows he is the same color as Hugo? You once said Ray has strong opinions on the fur color of dogs (preferring blondes if I remember correctly). Maybe in some way he knows Chester is a black cat. Just something to ponder. I must say tho that Chester's appearance timing was very appropriate. I am glad Ray, and you, have a friendly feline friend. It's hard to say if Ray can tell that Chester is black and makes a connection between him and Hugo. I'm sure they don't smell the same. Hugo probably always had that whiff of fear about him, while Chester certainly doesn't. We are glad that Chester is here too. I'm just a little concerned when he's sauntering across the back patio and Ray's dog door is open. This is so great!! I think they've made friend progress! I think so too, right up until the moment Ray makes a grab for Chester's neck.